Flower centerpieces are traditional table decorating ideas. Diy flower centerpieces, combined with tree branches and beach pebbles in different colors, create unusual, simple and stylish table decorations that add natural and colorful accents and a final touch to your party table decor. Simple table decorating ideas, that use natural materials, like beach pebbles, tree branches, fall leaves, dried fruits, vegetables, pine cones and acorns, are inexpensive and impressive. Flower centerpieces, decorated with natural materials that you can find in your backyard or in a public park, make beautiful eco friendly table decorations that look gorgeous any time of the year. Simple and easy to make, diy flower centerpiece ideas are especially great for holidays, when you are busy preparing specials meals and decorating your home. Two wonderful, quick to make and charming table decorating ideas from professional florists will help you to create pretty flower centerpieces that will pleasantly surprise and delight your guests, saving your time and money on table decor. 2) glass vases, plastic straws for holding flowers, dried flowers with long stems, beach pebbles or small rocks in white, gray and bluish colors. 1. Make a small hollow in a craft foam cube with a spoon for a glass Christmas ball. 2. Wrap the brick with attractive wallpaper or decorate it with wrapping paper. 3. Fill the glass Christmas ball with water and put your favorite flower into the ball. 4. Place the flower centerpiece on an attractive plate, decorated with small tree branches or any other natural decorative material that will create a strong color contrast with your flower centerpiece and emphasize the elegance and charm of your table decoration ideas. 5. Make few similar single flower centerpieces to add more color to your party table decor. Spread unusual flower centerpieces arount the table or group together, arranging transparent Christmas balls on craft form bases in different sizes, for designing dramatic table decoration ideas for your special event. 1. 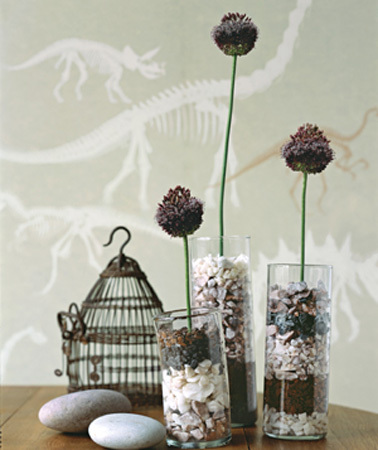 Select small glass vases and your favorite fresh or dried flowers for making simple and elegant flower centerpieces. 2. Cut a plastic straw 1 inch (2.5 cm) shorter than a vase, put it inside the vase and add one layer of small rocks or beach pebbles. 3. Add rock or beach pebble in different colors, creating layers that add attractive contrasts to your flower centerpieces. 4. Place a flower into a plastic straw and fill the vase with water. Simple and elegant, these table decorating ideas will help add a personal touch to your dinner or party table decor, making your home feel cozy, stylish and welcoming.